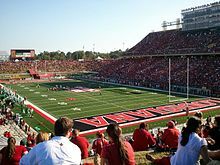 Cajun Field is a football stadium located in the city of Lafayette, Louisiana. Nicknamed The Swamp, it is the home field of Louisiana Ragin' Cajuns athletics. Cajun Field is primarily used for its American football team. Cajun Field has an official capacity of 41,426 with 2,577 chairback seats. In planning since at least 1967 (when a rendition was featured on the football media guide), it was built in 1970 as a replacement for McNaspy Stadium, opening on September 25, 1971 with a shutout of Santa Clara University. The stadium consists of a bowl with seating on the sidelines, with a second deck on the west sideline. In one of the biggest games at the stadium, on September 14, 1996, 38,783 spectators saw the Cajuns upset 25th-ranked Texas A&M, 29–22, the first victory for the Cajuns over a ranked opponent. The largest crowd at The Swamp as of 2013[update] was 41,357 fans on September 5, 2009, when the Cajuns beat Southern University 42–19 at the 9th annual Herbert Heymann Football Classic. The stadium won the Sun Belt Conference Attendance Championship in 2004, 2008, and 2011. 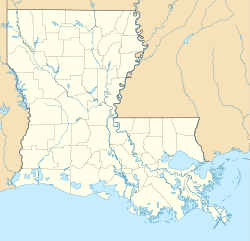 Because of Hurricane Katrina, the 2005 New Orleans Bowl was played here instead of in New Orleans, with Southern Miss defeating Arkansas State, 31–19. Also the Tulane Green Wave football team used it for a home game in 2005 after being displaced by the hurricane. In addition, Cajun Field hosted the final pre-season game of the New Orleans Breakers of the United States Football League on February 18, 1984, a 20–0 victory over the Memphis Showboats. In 1992, Cajun Field saw the attendance rise from 26,000 to 31,000 due to an upgrade to the ends of the stadium seating. In the summer of 2008 Cajun Field replaced its long-standing natural grass with ProGrass, an artificial turf. The stadium was pressure-washed and repainted. Advertisements and banners reading "University of Louisiana at Lafayette," "Ragin' Cajuns," and "www.ragincajuns.com" also were installed around the black retaining wall that surrounds the field. Cajun Field's surface is two feet below sea level in a natural bowl. With the below-sea level playing surface, a total of four 60 horsepower (45 kW) pumps and a sophisticated drainage system help keep the field in good playing condition even during the frequent south Louisiana rainstorms. The subsurface stadium requires many fans to walk down to their seats. Ragin' Cajuns football players and their opponents enter Cajun Field through an underground tunnel from the Louisiana-Lafayette athletics complex. In 1988 the stadium was nicknamed "The Swamp," as then noted on stadium signage, in the school yearbook and, a year later, in the 1989 official Southwestern Louisiana sports media guide. The nickname is tied to the field's early 1970s construction, and even refers to the original football field for what was then the Southwestern Louisiana Industrial Institute in the early 1900s. The university's first football field was on the main campus adjacent to a small cypress pond, which later became Cypress Lake, also nicknamed The Swamp. 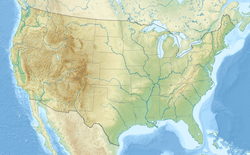 The "Swamp" nickname also fits with the area's geography, with many bayous and wetlands, including the Atchafalaya Basin and the nearby Gulf of Mexico marshlands. The National Wetlands Research Center, a United States Geological Survey research facility at the University of Louisiana at Lafayette, is less than half a mile from Cajun Field. Division I FBS Ben Hill Griffin Stadium at the University of Florida was later also nicknamed "The Swamp" by then-Gators head coach Steve Spurrier in 1991. ^ 2006 Ragin' Cajuns Football Media Guide, p. 111. ^ "Bayou Bash at The Swamp". Archived from the original on 2009-09-12. Retrieved September 6, 2009. ^ "Cajun Field". Ragin' Cajuns Athletic Department.